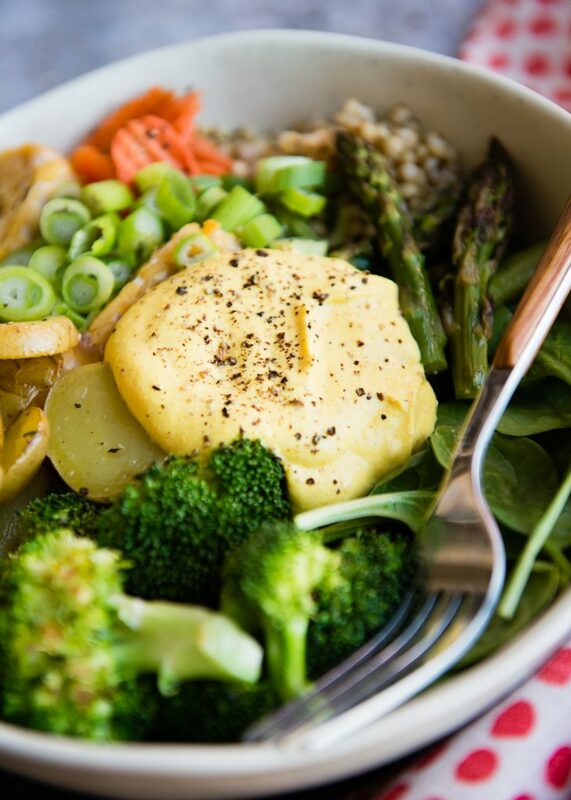 Ah, the Buddha Bowl–the darling of the food world, and Instagram. 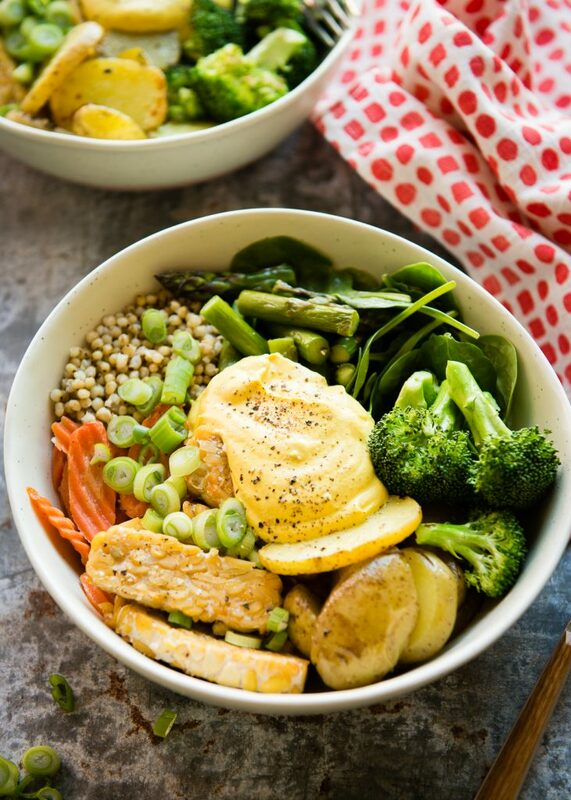 Believe me, I am all about veggie bowls! 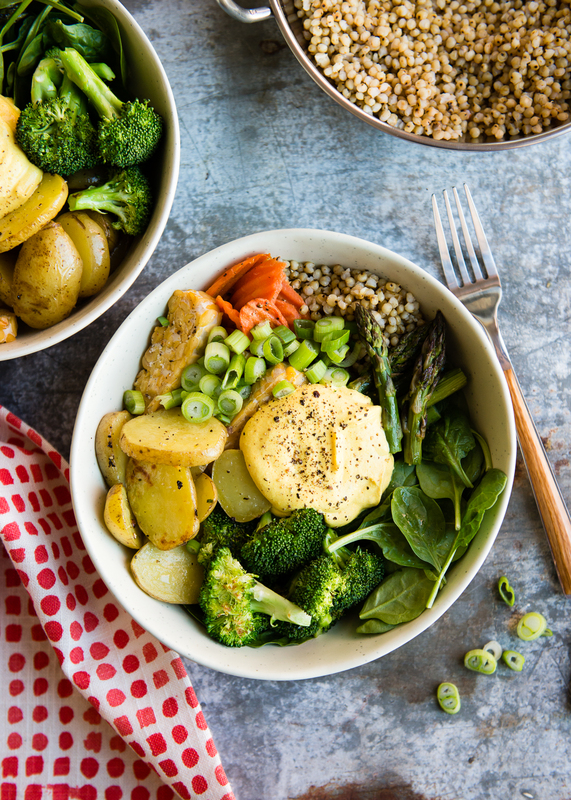 There is no easier meal than topping your favorite grain with a boatload of veggies and a drizzle of yummy sauce. 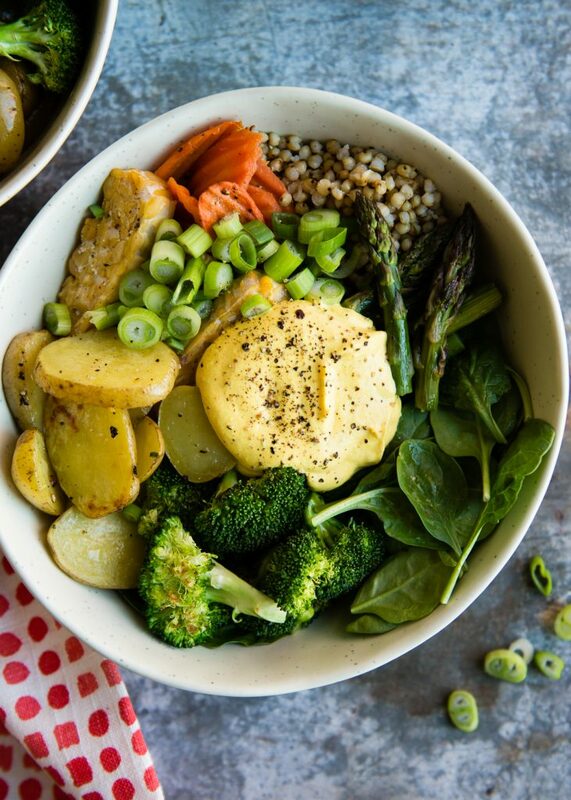 In this case, we’re talking about loaded Spring Buddha Bowls made with sorghum (more on that in a second), verdant spring veggies, and golden Creamy Turmeric Dressing. Sorghum is not new to me. I’ve been using sorghum flour for years in my gluten-free baking adventures. I’ve eaten popped sorghum several times. And I’ve even had sorghum molasses. But the little grains, native to Australia, I had not eaten up until a few weeks ago. If you’ve had barley, wheat or rye berries, then you’ll know what the texture is like. Very chewy and nutty, and utterly delicious. Also, hallelujah, it’s spring! Bring on the green! After winter’s starchy root veggies and squash, I’m all about the asparagus and spinach. I did include carrots and baby potatoes because they are also a sign of spring produce. And broccoli. Always the broccoli. Let’s talk about this dressing for a minute though. Turmeric is everywhere right now. Golden milk has taken over the world. I drink some every day myself. Turmeric has pretty awesome anti-inflammatory benefits. If you’re not a fan of golden milk, or you just want to add some more turmeric into your diet, this sauce is going to be your thing. In order to absorb all the benefits of turmeric, it should be eaten with a fat. 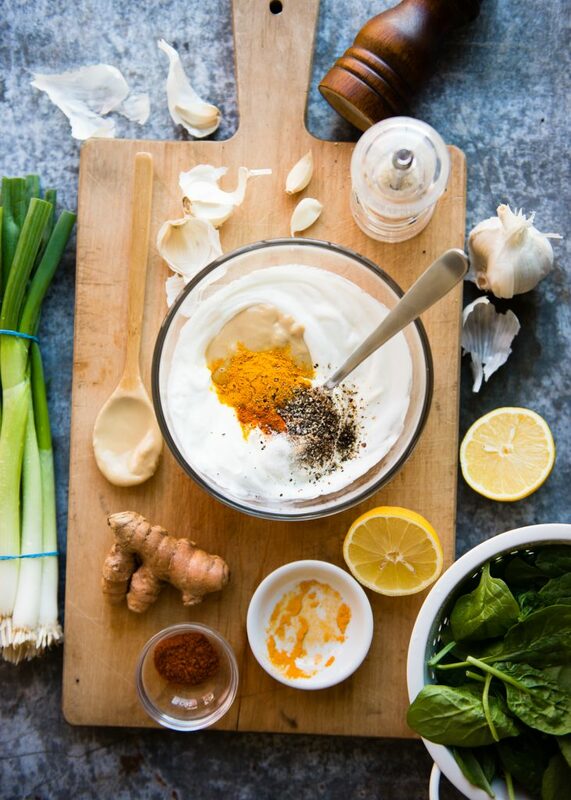 This dressing uses both tahini and full-fat Greek yogurt (also high in protein! ), but unsweetened full-fat coconut milk or yogurt can easily be substituted. And from there, the flavor is very much like golden milk, only without the sweeteners. 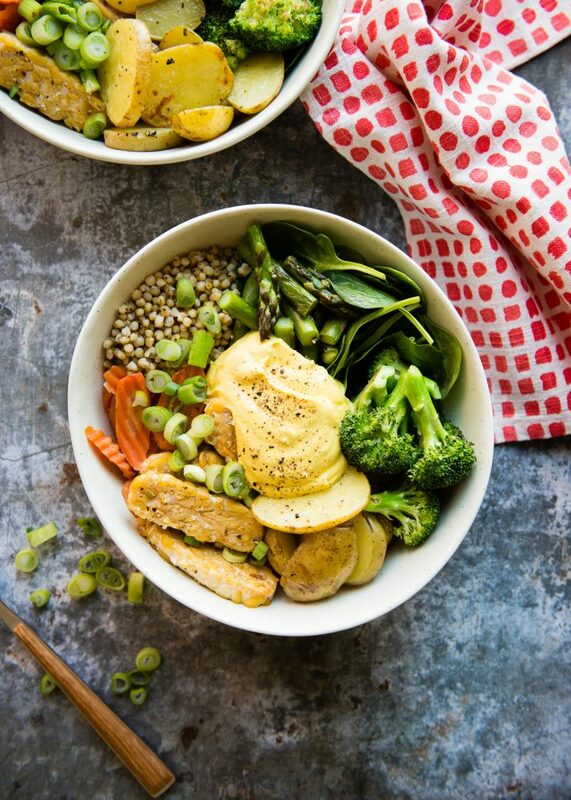 The best Buddha bowls, in my opinion, contain a protein component. I’ve chosen tempeh because it’s my favorite vegetarian protein of the moment. It goes well with most veggies and sauces due to its mild flavor. Tofu and chickpeas are other great meatless options. And if you don’t want to go the meatless route? Chicken or fish (particularly salmon or firm, white fish) would be a great way to go. I am going to always be a fan of sheet pan dinners, so that’s how I cook my veggies for these Spring Buddha Bowls. It makes clean-up a snap, and roasted veggies are simply delicious. I made sure to slice or cut the veggies into sizes that would cook at roughly the same time. If you prefer your veggies more crisp or tender, adjust the roasting time accordingly. 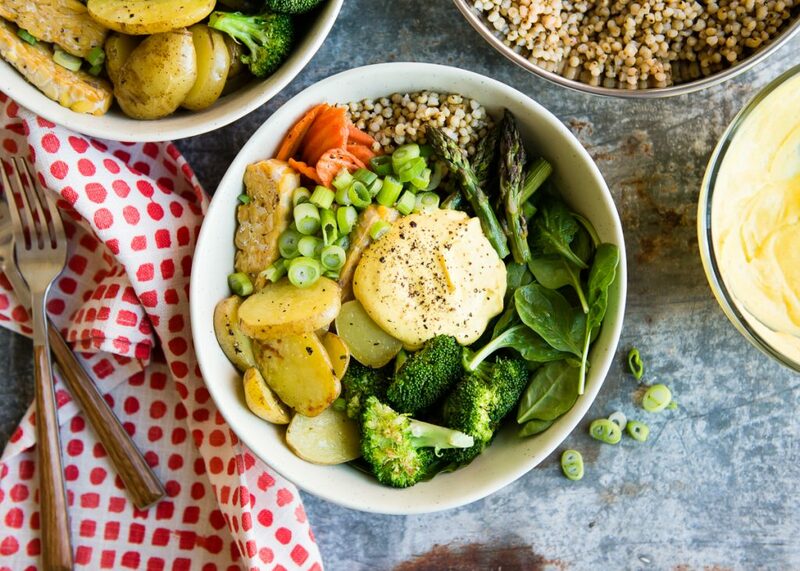 Full of fresh spring veggies, this bowl is loaded with flavor and nutrients. Add a big dollop of turmeric dressing to round out the dish. Meanwhile, prepare the Creamy Turmeric Dressing. Stir together all of the ingredients. Taste and add more salt or pepper, to taste. Set aside. 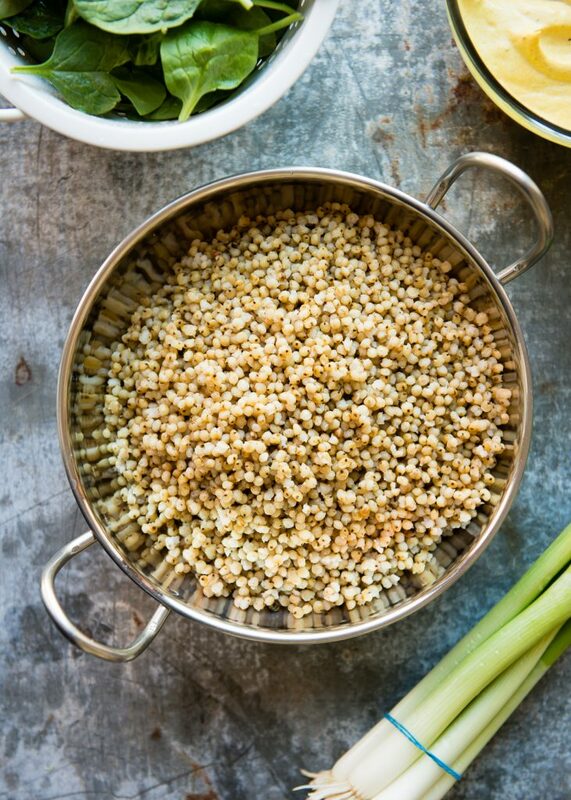 To serve, place 1/2 cup of sorghum and 1 cup of spinach into two shallow serving bowls. Divide the veggies and tempeh between the bowls. 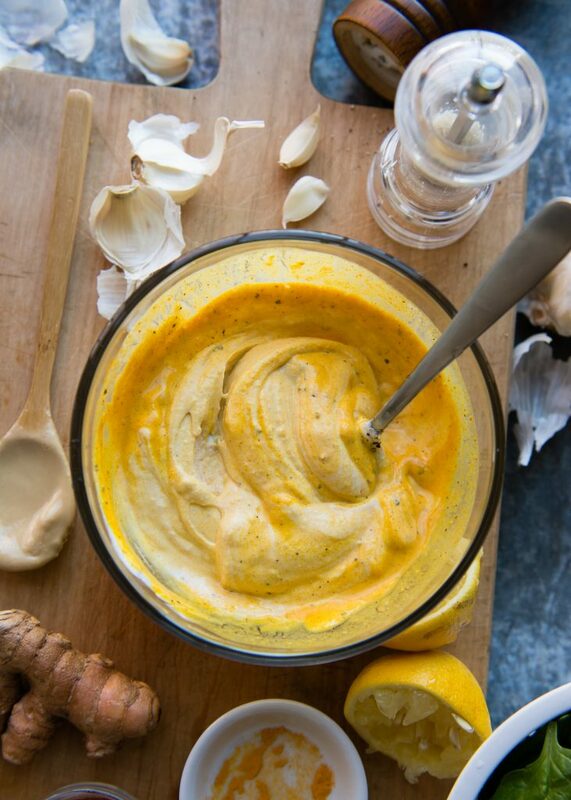 Spoon a big dollop of the Creamy Turmeric Dressing on top and serve immediately. 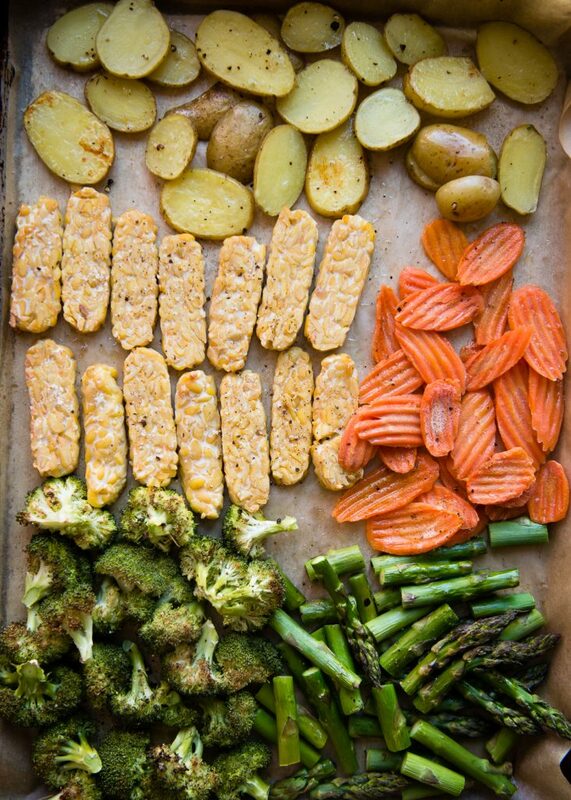 Substitute tempeh with chicken, chickpeas (add to sheet pan during last 5-7 minutes of roasting), fish, or tofu.